"Lightspeed" redirects here. For other uses, see Speed of light (disambiguation) and Lightspeed (disambiguation). Sunlight takes about 8 minutes 17 seconds to travel the average distance from the surface of the Sun to the Earth. The speed of light in vacuum, commonly denoted c, is a universal physical constant important in many areas of physics. Its exact value is 7008299792458000000♠299,792,458 metres per second (approximately 300,000 km/s (186,000 mi/s)[Note 3]). It is exact because by international agreement a metre is defined as the length of the path travelled by light in vacuum during a time interval of 1/299792458 second. [Note 4] According to special relativity, c is the maximum speed at which all conventional matter and hence all known forms of information in the universe can travel. Though this speed is most commonly associated with light, it is in fact the speed at which all massless particles and changes of the associated fields travel in vacuum (including electromagnetic radiation and gravitational waves). Such particles and waves travel at c regardless of the motion of the source or the inertial reference frame of the observer. In the special and general theories of relativity, c interrelates space and time, and also appears in the famous equation of mass–energy equivalence E = mc2. The speed at which light propagates through transparent materials, such as glass or air, is less than c; similarly, the speed of electromagnetic waves in wire cables is slower than c. The ratio between c and the speed v at which light travels in a material is called the refractive index n of the material (n = c / v). For example, for visible light the refractive index of glass is typically around 1.5, meaning that light in glass travels at c / 1.5 ≈ 200,000 km/s (124,000 mi/s); the refractive index of air for visible light is about 1.0003, so the speed of light in air is about 299,700 km/s (186,220 mi/s), which is about 90 km/s (56 mi/s) slower than c.
After centuries of increasingly precise measurements, in 1975 the speed of light was known to be 299792458 m/s (983571056 ft/s; 186282.397 mi/s) with a measurement uncertainty of 4 parts per billion. In 1983, the metre was redefined in the International System of Units (SI) as the distance travelled by light in vacuum in 1/7008299792458000000♠299792458 of a second. The speed of light in vacuum is usually denoted by a lowercase c, for "constant" or the Latin celeritas (meaning "swiftness, celerity"). In 1856, Wilhelm Eduard Weber and Rudolf Kohlrausch had used c for a different constant later shown to equal √2 times the speed of light in vacuum. Historically, the symbol V was used as an alternative symbol for the speed of light, introduced by James Clerk Maxwell in 1865. In 1894, Paul Drude redefined c with its modern meaning. Einstein used V in his original German-language papers on special relativity in 1905, but in 1907 he switched to c, which by then had become the standard symbol for the speed of light. Sometimes c is used for the speed of waves in any material medium, and c0 for the speed of light in vacuum. This subscripted notation, which is endorsed in official SI literature, has the same form as other related constants: namely, μ0 for the vacuum permeability or magnetic constant, ε0 for the vacuum permittivity or electric constant, and Z0 for the impedance of free space. This article uses c exclusively for the speed of light in vacuum. Since 1983, the metre has been defined in the International System of Units (SI) as the distance light travels in vacuum in ​1⁄7008299792458000000♠299792458 of a second. This definition fixes the speed of light in vacuum at exactly 7008299792458000000♠299,792,458 m/s. As a dimensional physical constant, the numerical value of c is different for different unit systems. [Note 3] In branches of physics in which c appears often, such as in relativity, it is common to use systems of natural units of measurement or the geometrized unit system where c = 1. Using these units, c does not appear explicitly because multiplication or division by 1 does not affect the result. The speed at which light waves propagate in vacuum is independent both of the motion of the wave source and of the inertial frame of reference of the observer. [Note 5] This invariance of the speed of light was postulated by Einstein in 1905, after being motivated by Maxwell's theory of electromagnetism and the lack of evidence for the luminiferous aether; it has since been consistently confirmed by many experiments. 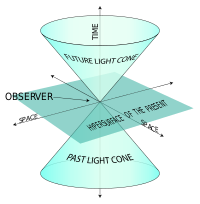 It is only possible to verify experimentally that the two-way speed of light (for example, from a source to a mirror and back again) is frame-independent, because it is impossible to measure the one-way speed of light (for example, from a source to a distant detector) without some convention as to how clocks at the source and at the detector should be synchronized. However, by adopting Einstein synchronization for the clocks, the one-way speed of light becomes equal to the two-way speed of light by definition. The special theory of relativity explores the consequences of this invariance of c with the assumption that the laws of physics are the same in all inertial frames of reference. One consequence is that c is the speed at which all massless particles and waves, including light, must travel in vacuum. 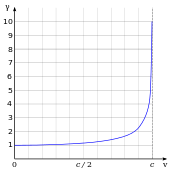 The Lorentz factor γ as a function of velocity. It starts at 1 and approaches infinity as v approaches c.
Special relativity has many counterintuitive and experimentally verified implications. These include the equivalence of mass and energy (E = mc2), length contraction (moving objects shorten),[Note 6] and time dilation (moving clocks run more slowly). The factor γ by which lengths contract and times dilate is known as the Lorentz factor and is given by γ = (1 − v2/c2)−1/2, where v is the speed of the object. The difference of γ from 1 is negligible for speeds much slower than c, such as most everyday speeds—in which case special relativity is closely approximated by Galilean relativity—but it increases at relativistic speeds and diverges to infinity as v approaches c. For example, a time dilation factor of γ = 2 occurs at a relative velocity of 86.6% of the speed of light (v = .866c). Similarly, a time dilation factor of γ = 10 occurs at v = 99.5% c.
The results of special relativity can be summarized by treating space and time as a unified structure known as spacetime (with c relating the units of space and time), and requiring that physical theories satisfy a special symmetry called Lorentz invariance, whose mathematical formulation contains the parameter c. Lorentz invariance is an almost universal assumption for modern physical theories, such as quantum electrodynamics, quantum chromodynamics, the Standard Model of particle physics, and general relativity. As such, the parameter c is ubiquitous in modern physics, appearing in many contexts that are unrelated to light. For example, general relativity predicts that c is also the speed of gravity and of gravitational waves. 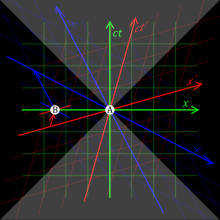 [Note 7] In non-inertial frames of reference (gravitationally curved spacetime or accelerated reference frames), the local speed of light is constant and equal to c, but the speed of light along a trajectory of finite length can differ from c, depending on how distances and times are defined. It is generally assumed that fundamental constants such as c have the same value throughout spacetime, meaning that they do not depend on location and do not vary with time. However, it has been suggested in various theories that the speed of light may have changed over time. No conclusive evidence for such changes has been found, but they remain the subject of ongoing research. It also is generally assumed that the speed of light is isotropic, meaning that it has the same value regardless of the direction in which it is measured. Observations of the emissions from nuclear energy levels as a function of the orientation of the emitting nuclei in a magnetic field (see Hughes–Drever experiment), and of rotating optical resonators (see Resonator experiments) have put stringent limits on the possible two-way anisotropy. According to special relativity, the energy of an object with rest mass m and speed v is given by γmc2, where γ is the Lorentz factor defined above. When v is zero, γ is equal to one, giving rise to the famous E = mc2 formula for mass–energy equivalence. The γ factor approaches infinity as v approaches c, and it would take an infinite amount of energy to accelerate an object with mass to the speed of light. The speed of light is the upper limit for the speeds of objects with positive rest mass, and individual photons cannot travel faster than the speed of light. This is experimentally established in many tests of relativistic energy and momentum. Event A precedes B in the red frame, is simultaneous with B in the green frame, and follows B in the blue frame. More generally, it is normally impossible for information or energy to travel faster than c. One argument for this follows from the counter-intuitive implication of special relativity known as the relativity of simultaneity. If the spatial distance between two events A and B is greater than the time interval between them multiplied by c then there are frames of reference in which A precedes B, others in which B precedes A, and others in which they are simultaneous. As a result, if something were travelling faster than c relative to an inertial frame of reference, it would be travelling backwards in time relative to another frame, and causality would be violated. [Note 8] In such a frame of reference, an "effect" could be observed before its "cause". Such a violation of causality has never been recorded, and would lead to paradoxes such as the tachyonic antitelephone. There are situations in which it may seem that matter, energy, or information travels at speeds greater than c, but they do not. For example, as is discussed in the propagation of light in a medium section below, many wave velocities can exceed c. For example, the phase velocity of X-rays through most glasses can routinely exceed c, but phase velocity does not determine the velocity at which waves convey information. 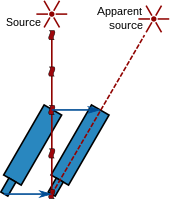 If a laser beam is swept quickly across a distant object, the spot of light can move faster than c, although the initial movement of the spot is delayed because of the time it takes light to get to the distant object at the speed c. However, the only physical entities that are moving are the laser and its emitted light, which travels at the speed c from the laser to the various positions of the spot. Similarly, a shadow projected onto a distant object can be made to move faster than c, after a delay in time. In neither case does any matter, energy, or information travel faster than light. The rate of change in the distance between two objects in a frame of reference with respect to which both are moving (their closing speed) may have a value in excess of c. However, this does not represent the speed of any single object as measured in a single inertial frame. Certain quantum effects appear to be transmitted instantaneously and therefore faster than c, as in the EPR paradox. An example involves the quantum states of two particles that can be entangled. Until either of the particles is observed, they exist in a superposition of two quantum states. If the particles are separated and one particle's quantum state is observed, the other particle's quantum state is determined instantaneously (i.e., faster than light could travel from one particle to the other). However, it is impossible to control which quantum state the first particle will take on when it is observed, so information cannot be transmitted in this manner. Another quantum effect that predicts the occurrence of faster-than-light speeds is called the Hartman effect: under certain conditions the time needed for a virtual particle to tunnel through a barrier is constant, regardless of the thickness of the barrier. This could result in a virtual particle crossing a large gap faster-than-light. However, no information can be sent using this effect. So-called superluminal motion is seen in certain astronomical objects, such as the relativistic jets of radio galaxies and quasars. However, these jets are not moving at speeds in excess of the speed of light: the apparent superluminal motion is a projection effect caused by objects moving near the speed of light and approaching Earth at a small angle to the line of sight: since the light which was emitted when the jet was farther away took longer to reach the Earth, the time between two successive observations corresponds to a longer time between the instants at which the light rays were emitted. In models of the expanding universe, the farther galaxies are from each other, the faster they drift apart. This receding is not due to motion through space, but rather to the expansion of space itself. For example, galaxies far away from Earth appear to be moving away from the Earth with a speed proportional to their distances. Beyond a boundary called the Hubble sphere, the rate at which their distance from Earth increases becomes greater than the speed of light. In modern quantum physics, the electromagnetic field is described by the theory of quantum electrodynamics (QED). In this theory, light is described by the fundamental excitations (or quanta) of the electromagnetic field, called photons. In QED, photons are massless particles and thus, according to special relativity, they travel at the speed of light in vacuum. Extensions of QED in which the photon has a mass have been considered. In such a theory, its speed would depend on its frequency, and the invariant speed c of special relativity would then be the upper limit of the speed of light in vacuum. No variation of the speed of light with frequency has been observed in rigorous testing, putting stringent limits on the mass of the photon. The limit obtained depends on the model used: if the massive photon is described by Proca theory, the experimental upper bound for its mass is about 10−57 grams; if photon mass is generated by a Higgs mechanism, the experimental upper limit is less sharp, m ≤ 10−14 eV/c2  (roughly 2 × 10−47 g). Another reason for the speed of light to vary with its frequency would be the failure of special relativity to apply to arbitrarily small scales, as predicted by some proposed theories of quantum gravity. In 2009, the observation of the spectrum of gamma-ray burst GRB 090510 did not find any difference in the speeds of photons of different energies, confirming that Lorentz invariance is verified at least down to the scale of the Planck length (lP = √ħ G/c3 ≈ 6965161630000000000♠1.6163×10−35 m) divided by 1.2. In a medium, light usually does not propagate at a speed equal to c; further, different types of light wave will travel at different speeds. The speed at which the individual crests and troughs of a plane wave (a wave filling the whole space, with only one frequency) propagate is called the phase velocity vp. An actual physical signal with a finite extent (a pulse of light) travels at a different speed. The largest part of the pulse travels at the group velocity vg, and its earliest part travels at the front velocity vf. The phase velocity is important in determining how a light wave travels through a material or from one material to another. It is often represented in terms of a refractive index. The refractive index of a material is defined as the ratio of c to the phase velocity vp in the material: larger indices of refraction indicate lower speeds. The refractive index of a material may depend on the light's frequency, intensity, polarization, or direction of propagation; in many cases, though, it can be treated as a material-dependent constant. The refractive index of air is approximately 1.0003. Denser media, such as water, glass, and diamond, have refractive indexes of around 1.3, 1.5 and 2.4, respectively, for visible light. In exotic materials like Bose–Einstein condensates near absolute zero, the effective speed of light may be only a few metres per second. However, this represents absorption and re-radiation delay between atoms, as do all slower-than-c speeds in material substances. As an extreme example of light "slowing" in matter, two independent teams of physicists claimed to bring light to a "complete standstill" by passing it through a Bose–Einstein condensate of the element rubidium, one team at Harvard University and the Rowland Institute for Science in Cambridge, Mass., and the other at the Harvard–Smithsonian Center for Astrophysics, also in Cambridge. However, the popular description of light being "stopped" in these experiments refers only to light being stored in the excited states of atoms, then re-emitted at an arbitrarily later time, as stimulated by a second laser pulse. During the time it had "stopped," it had ceased to be light. This type of behaviour is generally microscopically true of all transparent media which "slow" the speed of light. In transparent materials, the refractive index generally is greater than 1, meaning that the phase velocity is less than c. In other materials, it is possible for the refractive index to become smaller than 1 for some frequencies; in some exotic materials it is even possible for the index of refraction to become negative. The requirement that causality is not violated implies that the real and imaginary parts of the dielectric constant of any material, corresponding respectively to the index of refraction and to the attenuation coefficient, are linked by the Kramers–Kronig relations. In practical terms, this means that in a material with refractive index less than 1, the absorption of the wave is so quick that no signal can be sent faster than c.
A pulse with different group and phase velocities (which occurs if the phase velocity is not the same for all the frequencies of the pulse) smears out over time, a process known as dispersion. Certain materials have an exceptionally low (or even zero) group velocity for light waves, a phenomenon called slow light, which has been confirmed in various experiments. The opposite, group velocities exceeding c, has also been shown in experiment. It should even be possible for the group velocity to become infinite or negative, with pulses travelling instantaneously or backwards in time. None of these options, however, allow information to be transmitted faster than c. It is impossible to transmit information with a light pulse any faster than the speed of the earliest part of the pulse (the front velocity). It can be shown that this is (under certain assumptions) always equal to c.
It is possible for a particle to travel through a medium faster than the phase velocity of light in that medium (but still slower than c). When a charged particle does that in a dielectric material, the electromagnetic equivalent of a shock wave, known as Cherenkov radiation, is emitted. The speed of light is of relevance to communications: the one-way and round-trip delay time are greater than zero. This applies from small to astronomical scales. On the other hand, some techniques depend on the finite speed of light, for example in distance measurements. In supercomputers, the speed of light imposes a limit on how quickly data can be sent between processors. If a processor operates at 1 gigahertz, a signal can only travel a maximum of about 30 centimetres (1 ft) in a single cycle. Processors must therefore be placed close to each other to minimize communication latencies; this can cause difficulty with cooling. If clock frequencies continue to increase, the speed of light will eventually become a limiting factor for the internal design of single chips. Given that the equatorial circumference of the Earth is about 7007400750000000000♠40075 km and that c is about 7008300000000000000♠300000 km/s, the theoretical shortest time for a piece of information to travel half the globe along the surface is about 67 milliseconds. When light is travelling around the globe in an optical fibre, the actual transit time is longer, in part because the speed of light is slower by about 35% in an optical fibre, depending on its refractive index n.[Note 9] Furthermore, straight lines rarely occur in global communications situations, and delays are created when the signal passes through an electronic switch or signal regenerator. Similarly, communications between the Earth and spacecraft are not instantaneous. There is a brief delay from the source to the receiver, which becomes more noticeable as distances increase. This delay was significant for communications between ground control and Apollo 8 when it became the first manned spacecraft to orbit the Moon: for every question, the ground control station had to wait at least three seconds for the answer to arrive. The communications delay between Earth and Mars can vary between five and twenty minutes depending upon the relative positions of the two planets. As a consequence of this, if a robot on the surface of Mars were to encounter a problem, its human controllers would not be aware of it until at least five minutes later, and possibly up to twenty minutes later; it would then take a further five to twenty minutes for instructions to travel from Earth to Mars. NASA must wait several hours for information from a probe orbiting Jupiter, and if it needs to correct a navigation error, the fix will not arrive at the spacecraft for an equal amount of time, creating a risk of the correction not arriving in time. Receiving light and other signals from distant astronomical sources can even take much longer. For example, it has taken 13 billion (13×109) years for light to travel to Earth from the faraway galaxies viewed in the Hubble Ultra Deep Field images. Those photographs, taken today, capture images of the galaxies as they appeared 13 billion years ago, when the universe was less than a billion years old. The fact that more distant objects appear to be younger, due to the finite speed of light, allows astronomers to infer the evolution of stars, of galaxies, and of the universe itself. Astronomical distances are sometimes expressed in light-years, especially in popular science publications and media. A light-year is the distance light travels in one year, around 9461 billion kilometres, 5879 billion miles, or 0.3066 parsecs. In round figures, a light year is nearly 10 trillion kilometres or nearly 6 trillion miles. Proxima Centauri, the closest star to Earth after the Sun, is around 4.2 light-years away. Radar systems measure the distance to a target by the time it takes a radio-wave pulse to return to the radar antenna after being reflected by the target: the distance to the target is half the round-trip transit time multiplied by the speed of light. A Global Positioning System (GPS) receiver measures its distance to GPS satellites based on how long it takes for a radio signal to arrive from each satellite, and from these distances calculates the receiver's position. Because light travels about 7005300000000000000♠300000 kilometres (7008299337984000000♠186000 mi) in one second, these measurements of small fractions of a second must be very precise. The Lunar Laser Ranging Experiment, radar astronomy and the Deep Space Network determine distances to the Moon, planets and spacecraft, respectively, by measuring round-trip transit times. The speed of light has become important in high-frequency trading, where traders seek to gain minute advantages by delivering their trades to exchanges fractions of a second ahead of other traders. For example, traders have been switching to microwave communications between trading hubs, because of the advantage which microwaves travelling at near to the speed of light in air, have over fibre optic signals which travel 30–40% slower at the speed of light through glass. There are different ways to determine the value of c. One way is to measure the actual speed at which light waves propagate, which can be done in various astronomical and earth-based setups. However, it is also possible to determine c from other physical laws where it appears, for example, by determining the values of the electromagnetic constants ε0 and μ0 and using their relation to c. Historically, the most accurate results have been obtained by separately determining the frequency and wavelength of a light beam, with their product equalling c.
In 1983 the metre was defined as "the length of the path travelled by light in vacuum during a time interval of ​1⁄7008299792458000000♠299792458 of a second", fixing the value of the speed of light at 7008299792458000000♠299792458 m/s by definition, as described below. Consequently, accurate measurements of the speed of light yield an accurate realization of the metre rather than an accurate value of c.
Outer space is a convenient setting for measuring the speed of light because of its large scale and nearly perfect vacuum. 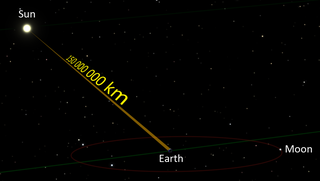 Typically, one measures the time needed for light to traverse some reference distance in the solar system, such as the radius of the Earth's orbit. Historically, such measurements could be made fairly accurately, compared to how accurately the length of the reference distance is known in Earth-based units. It is customary to express the results in astronomical units (AU) per day. Ole Christensen Rømer used an astronomical measurement to make the first quantitative estimate of the speed of light. When measured from Earth, the periods of moons orbiting a distant planet are shorter when the Earth is approaching the planet than when the Earth is receding from it. The distance travelled by light from the planet (or its moon) to Earth is shorter when the Earth is at the point in its orbit that is closest to its planet than when the Earth is at the farthest point in its orbit, the difference in distance being the diameter of the Earth's orbit around the Sun. The observed change in the moon's orbital period is caused by the difference in the time it takes light to traverse the shorter or longer distance. Rømer observed this effect for Jupiter's innermost moon Io and deduced that light takes 22 minutes to cross the diameter of the Earth's orbit. Aberration of light: light from a distant source appears to be from a different location for a moving telescope due to the finite speed of light. Another method is to use the aberration of light, discovered and explained by James Bradley in the 18th century. This effect results from the vector addition of the velocity of light arriving from a distant source (such as a star) and the velocity of its observer (see diagram on the right). A moving observer thus sees the light coming from a slightly different direction and consequently sees the source at a position shifted from its original position. Since the direction of the Earth's velocity changes continuously as the Earth orbits the Sun, this effect causes the apparent position of stars to move around. From the angular difference in the position of stars (maximally 20.5 arcseconds) it is possible to express the speed of light in terms of the Earth's velocity around the Sun, which with the known length of a year can be converted to the time needed to travel from the Sun to the Earth. In 1729, Bradley used this method to derive that light travelled 10,210 times faster than the Earth in its orbit (the modern figure is 10,066 times faster) or, equivalently, that it would take light 8 minutes 12 seconds to travel from the Sun to the Earth. An astronomical unit (AU) is approximately the average distance between the Earth and Sun. It was redefined in 2012 as exactly 7011149597870700000♠149597870700 m. Previously the AU was not based on the International System of Units but in terms of the gravitational force exerted by the Sun in the framework of classical mechanics. [Note 10] The current definition uses the recommended value in metres for the previous definition of the astronomical unit, which was determined by measurement. This redefinition is analogous to that of the metre, and likewise has the effect of fixing the speed of light to an exact value in astronomical units per second (via the exact speed of light in metres per second). c = 7008299792457999999♠0.00200398880410(4) AU/s = 7002173144632674000♠173.144632674(3) AU/day. A method of measuring the speed of light is to measure the time needed for light to travel to a mirror at a known distance and back. This is the working principle behind the Fizeau–Foucault apparatus developed by Hippolyte Fizeau and Léon Foucault. The setup as used by Fizeau consists of a beam of light directed at a mirror 8 kilometres (5 mi) away. On the way from the source to the mirror, the beam passes through a rotating cogwheel. At a certain rate of rotation, the beam passes through one gap on the way out and another on the way back, but at slightly higher or lower rates, the beam strikes a tooth and does not pass through the wheel. Knowing the distance between the wheel and the mirror, the number of teeth on the wheel, and the rate of rotation, the speed of light can be calculated. The method of Foucault replaces the cogwheel by a rotating mirror. Because the mirror keeps rotating while the light travels to the distant mirror and back, the light is reflected from the rotating mirror at a different angle on its way out than it is on its way back. From this difference in angle, the known speed of rotation and the distance to the distant mirror the speed of light may be calculated. Nowadays, using oscilloscopes with time resolutions of less than one nanosecond, the speed of light can be directly measured by timing the delay of a light pulse from a laser or an LED reflected from a mirror. This method is less precise (with errors of the order of 1%) than other modern techniques, but it is sometimes used as a laboratory experiment in college physics classes. An option for deriving c that does not directly depend on a measurement of the propagation of electromagnetic waves is to use the relation between c and the vacuum permittivity ε0 and vacuum permeability μ0 established by Maxwell's theory: c2 = 1/(ε0μ0). The vacuum permittivity may be determined by measuring the capacitance and dimensions of a capacitor, whereas the value of the vacuum permeability is fixed at exactly 6993400000000000000♠4π×10−7 H⋅m−1 through the definition of the ampere. Rosa and Dorsey used this method in 1907 to find a value of 7008299710000000000♠299710±22 km/s. Electromagnetic standing waves in a cavity. Another way to measure the speed of light is to independently measure the frequency f and wavelength λ of an electromagnetic wave in vacuum. The value of c can then be found by using the relation c = fλ. One option is to measure the resonance frequency of a cavity resonator. If the dimensions of the resonance cavity are also known, these can be used to determine the wavelength of the wave. In 1946, Louis Essen and A.C. Gordon-Smith established the frequency for a variety of normal modes of microwaves of a microwave cavity of precisely known dimensions. The dimensions were established to an accuracy of about ±0.8 μm using gauges calibrated by interferometry. As the wavelength of the modes was known from the geometry of the cavity and from electromagnetic theory, knowledge of the associated frequencies enabled a calculation of the speed of light. The Essen–Gordon-Smith result, 7008299792000000000♠299792±9 km/s, was substantially more precise than those found by optical techniques. By 1950, repeated measurements by Essen established a result of 7008299792500000000♠299792.5±3.0 km/s. A household demonstration of this technique is possible, using a microwave oven and food such as marshmallows or margarine: if the turntable is removed so that the food does not move, it will cook the fastest at the antinodes (the points at which the wave amplitude is the greatest), where it will begin to melt. The distance between two such spots is half the wavelength of the microwaves; by measuring this distance and multiplying the wavelength by the microwave frequency (usually displayed on the back of the oven, typically 2450 MHz), the value of c can be calculated, "often with less than 5% error". An interferometric determination of length. Left: constructive interference; Right: destructive interference. Interferometry is another method to find the wavelength of electromagnetic radiation for determining the speed of light. [Note 12] A coherent beam of light (e.g. 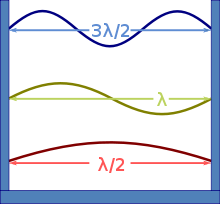 from a laser), with a known frequency (f), is split to follow two paths and then recombined. By adjusting the path length while observing the interference pattern and carefully measuring the change in path length, the wavelength of the light (λ) can be determined. The speed of light is then calculated using the equation c = λf. Before the advent of laser technology, coherent radio sources were used for interferometry measurements of the speed of light. However interferometric determination of wavelength becomes less precise with wavelength and the experiments were thus limited in precision by the long wavelength (~0.4 cm (0.16 in)) of the radiowaves. The precision can be improved by using light with a shorter wavelength, but then it becomes difficult to directly measure the frequency of the light. One way around this problem is to start with a low frequency signal of which the frequency can be precisely measured, and from this signal progressively synthesize higher frequency signals whose frequency can then be linked to the original signal. A laser can then be locked to the frequency, and its wavelength can be determined using interferometry. This technique was due to a group at the National Bureau of Standards (NBS) (which later became NIST). They used it in 1972 to measure the speed of light in vacuum with a fractional uncertainty of 6991350000000000000♠3.5×10−9. Until the early modern period, it was not known whether light travelled instantaneously or at a very fast finite speed. The first extant recorded examination of this subject was in ancient Greece. The ancient Greeks, Muslim scholars, and classical European scientists long debated this until Rømer provided the first calculation of the speed of light. Einstein's Theory of Special Relativity concluded that the speed of light is constant regardless of one's frame of reference. Since then, scientists have provided increasingly accurate measurements. Empedocles (c. 490–430 BC) was the first to propose a theory of light and claimed that light has a finite speed. He maintained that light was something in motion, and therefore must take some time to travel. Aristotle argued, to the contrary, that "light is due to the presence of something, but it is not a movement". 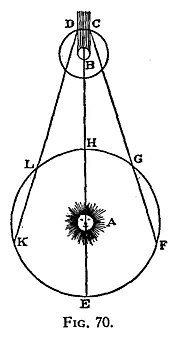 Euclid and Ptolemy advanced Empedocles' emission theory of vision, where light is emitted from the eye, thus enabling sight. Based on that theory, Heron of Alexandria argued that the speed of light must be infinite because distant objects such as stars appear immediately upon opening the eyes. Early Islamic philosophers initially agreed with the Aristotelian view that light had no speed of travel. In 1021, Alhazen (Ibn al-Haytham) published the Book of Optics, in which he presented a series of arguments dismissing the emission theory of vision in favour of the now accepted intromission theory, in which light moves from an object into the eye. This led Alhazen to propose that light must have a finite speed, and that the speed of light is variable, decreasing in denser bodies. He argued that light is substantial matter, the propagation of which requires time, even if this is hidden from our senses. Also in the 11th century, Abū Rayhān al-Bīrūnī agreed that light has a finite speed, and observed that the speed of light is much faster than the speed of sound. In the 13th century, Roger Bacon argued that the speed of light in air was not infinite, using philosophical arguments backed by the writing of Alhazen and Aristotle. In the 1270s, Witelo considered the possibility of light travelling at infinite speed in vacuum, but slowing down in denser bodies. In the early 17th century, Johannes Kepler believed that the speed of light was infinite, since empty space presents no obstacle to it. René Descartes argued that if the speed of light were to be finite, the Sun, Earth, and Moon would be noticeably out of alignment during a lunar eclipse. Since such misalignment had not been observed, Descartes concluded the speed of light was infinite. Descartes speculated that if the speed of light were found to be finite, his whole system of philosophy might be demolished. In Descartes' derivation of Snell's law, he assumed that even though the speed of light was instantaneous, the denser the medium, the faster was light's speed. Pierre de Fermat derived Snell's law using the opposing assumption, the denser the medium the slower light traveled. Fermat also argued in support of a finite speed of light. In 1629, Isaac Beeckman proposed an experiment in which a person observes the flash of a cannon reflecting off a mirror about one mile (1.6 km) away. In 1638, Galileo Galilei proposed an experiment, with an apparent claim to having performed it some years earlier, to measure the speed of light by observing the delay between uncovering a lantern and its perception some distance away. He was unable to distinguish whether light travel was instantaneous or not, but concluded that if it were not, it must nevertheless be extraordinarily rapid. In 1667, the Accademia del Cimento of Florence reported that it had performed Galileo's experiment, with the lanterns separated by about one mile, but no delay was observed. The actual delay in this experiment would have been about 11 microseconds. The first quantitative estimate of the speed of light was made in 1676 by Rømer (see Rømer's determination of the speed of light). From the observation that the periods of Jupiter's innermost moon Io appeared to be shorter when the Earth was approaching Jupiter than when receding from it, he concluded that light travels at a finite speed, and estimated that it takes light 22 minutes to cross the diameter of Earth's orbit. Christiaan Huygens combined this estimate with an estimate for the diameter of the Earth's orbit to obtain an estimate of speed of light of 7008220000000000000♠220000 km/s, 26% lower than the actual value. In his 1704 book Opticks, Isaac Newton reported Rømer's calculations of the finite speed of light and gave a value of "seven or eight minutes" for the time taken for light to travel from the Sun to the Earth (the modern value is 8 minutes 19 seconds). Newton queried whether Rømer's eclipse shadows were coloured; hearing that they were not, he concluded the different colours travelled at the same speed. In 1729, James Bradley discovered stellar aberration. From this effect he determined that light must travel 10,210 times faster than the Earth in its orbit (the modern figure is 10,066 times faster) or, equivalently, that it would take light 8 minutes 12 seconds to travel from the Sun to the Earth. In the 19th century Hippolyte Fizeau developed a method to determine the speed of light based on time-of-flight measurements on Earth and reported a value of 7008315000000000000♠315000 km/s. His method was improved upon by Léon Foucault who obtained a value of 7008298000000000000♠298000 km/s in 1862. In the year 1856, Wilhelm Eduard Weber and Rudolf Kohlrausch measured the ratio of the electromagnetic and electrostatic units of charge, 1/√ε0μ0, by discharging a Leyden jar, and found that its numerical value was very close to the speed of light as measured directly by Fizeau. The following year Gustav Kirchhoff calculated that an electric signal in a resistanceless wire travels along the wire at this speed. In the early 1860s, Maxwell showed that, according to the theory of electromagnetism he was working on, electromagnetic waves propagate in empty space at a speed equal to the above Weber/Kohlrausch ratio, and drawing attention to the numerical proximity of this value to the speed of light as measured by Fizeau, he proposed that light is in fact an electromagnetic wave. 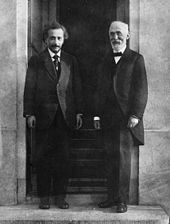 Hendrik Lorentz (right) with Albert Einstein. It was thought at the time that empty space was filled with a background medium called the luminiferous aether in which the electromagnetic field existed. Some physicists thought that this aether acted as a preferred frame of reference for the propagation of light and therefore it should be possible to measure the motion of the Earth with respect to this medium, by measuring the isotropy of the speed of light. Beginning in the 1880s several experiments were performed to try to detect this motion, the most famous of which is the experiment performed by Albert A. Michelson and Edward W. Morley in 1887. The detected motion was always less than the observational error. Modern experiments indicate that the two-way speed of light is isotropic (the same in every direction) to within 6 nanometres per second. Because of this experiment Hendrik Lorentz proposed that the motion of the apparatus through the aether may cause the apparatus to contract along its length in the direction of motion, and he further assumed, that the time variable for moving systems must also be changed accordingly ("local time"), which led to the formulation of the Lorentz transformation. Based on Lorentz's aether theory, Henri Poincaré (1900) showed that this local time (to first order in v/c) is indicated by clocks moving in the aether, which are synchronized under the assumption of constant light speed. In 1904, he speculated that the speed of light could be a limiting velocity in dynamics, provided that the assumptions of Lorentz's theory are all confirmed. In 1905, Poincaré brought Lorentz's aether theory into full observational agreement with the principle of relativity. In 1905 Einstein postulated from the outset that the speed of light in vacuum, measured by a non-accelerating observer, is independent of the motion of the source or observer. Using this and the principle of relativity as a basis he derived the special theory of relativity, in which the speed of light in vacuum c featured as a fundamental constant, also appearing in contexts unrelated to light. This made the concept of the stationary aether (to which Lorentz and Poincaré still adhered) useless and revolutionized the concepts of space and time. In the second half of the 20th century much progress was made in increasing the accuracy of measurements of the speed of light, first by cavity resonance techniques and later by laser interferometer techniques. These were aided by new, more precise, definitions of the metre and second. In 1950, Louis Essen determined the speed as 7008299792500000000♠299792.5±1 km/s, using cavity resonance. This value was adopted by the 12th General Assembly of the Radio-Scientific Union in 1957. In 1960, the metre was redefined in terms of the wavelength of a particular spectral line of krypton-86, and, in 1967, the second was redefined in terms of the hyperfine transition frequency of the ground state of caesium-133. In 1972, using the laser interferometer method and the new definitions, a group at the US National Bureau of Standards in Boulder, Colorado determined the speed of light in vacuum to be c = 7008299792456200000♠299792456.2±1.1 m/s. This was 100 times less uncertain than the previously accepted value. The remaining uncertainty was mainly related to the definition of the metre. [Note 14] As similar experiments found comparable results for c, the 15th General Conference on Weights and Measures in 1975 recommended using the value 7008299792458000000♠299792458 m/s for the speed of light. In 1983 the 17th CGPM found that wavelengths from frequency measurements and a given value for the speed of light are more reproducible than the previous standard. They kept the 1967 definition of second, so the caesium hyperfine frequency would now determine both the second and the metre. To do this, they redefined the metre as: "The metre is the length of the path travelled by light in vacuum during a time interval of 1/7008299792458000000♠299792458 of a second." As a result of this definition, the value of the speed of light in vacuum is exactly 7008299792458000000♠299792458 m/s and has become a defined constant in the SI system of units. Improved experimental techniques that prior to 1983 would have measured the speed of light, no longer affect the known value of the speed of light in SI units, but instead allow a more precise realization of the metre by more accurately measuring the wavelength of Krypton-86 and other light sources. In 2011, the CGPM stated its intention to redefine all seven SI base units using what it calls "the explicit-constant formulation", where each "unit is defined indirectly by specifying explicitly an exact value for a well-recognized fundamental constant", as was done for the speed of light. It proposed a new, but completely equivalent, wording of the metre's definition: "The metre, symbol m, is the unit of length; its magnitude is set by fixing the numerical value of the speed of light in vacuum to be equal to exactly 7008299792458000000♠299792458 when it is expressed in the SI unit m s−1." This is one of the proposed changes to be incorporated in the next revision of the SI also termed the New SI. ^ a b The speed of light in imperial units and US units is based on an inch of exactly 6998254000000000000♠2.54 cm and is exactly 186,282 miles, 698 yards, 2 feet, and 5 21/127 inches per second. ^ Which is in turn defined to be the length of time occupied by 9,192,631,770 cycles of the radiation emitted by a cesium-133 atom in a transition between two specified energy states. ^ However, the frequency of light can depend on the motion of the source relative to the observer, due to the Doppler effect. ^ Whereas moving objects are measured to be shorter along the line of relative motion, they are also seen as being rotated. This effect, known as Terrell rotation, is due to the different times that light from different parts of the object takes to reach the observer. ^ The interpretation of observations on binary systems used to determine the speed of gravity is considered doubtful by some authors, leaving the experimental situation uncertain. ^ It is thought that the Scharnhorst effect does allow signals to travel slightly faster than c, but the special conditions in which this effect can occur prevent one from using this effect to violate causality. ^ A typical value for the refractive index of optical fibre is between 1.518 and 1.538. ^ The astronomical unit was defined as the radius of an unperturbed circular Newtonian orbit about the Sun of a particle having infinitesimal mass, moving with an angular frequency of 0.01720209895 radians (approximately ​1⁄7002365256898000000♠365.256898 of a revolution) per day. ^ Nevertheless, at this degree of precision, the effects of general relativity must be taken into consideration when interpreting the length. The metre is considered to be a unit of proper length, whereas the AU is usually used as a unit of observed length in a given frame of reference. The values cited here follow the latter convention, and are TDB-compatible. ^ A detailed discussion of the interferometer and its use for determining the speed of light can be found in Vaughan (1989). ^ According to Galileo, the lanterns he used were "at a short distance, less than a mile." Assuming the distance was not too much shorter than a mile, and that "about a thirtieth of a second is the minimum time interval distinguishable by the unaided eye", Boyer notes that Galileo's experiment could at best be said to have established a lower limit of about 60 miles per second for the velocity of light. ^ Between 1960 and 1983 the metre was defined as: "The metre is the length equal to 7006165076373000000♠1650763.73 wavelengths in vacuum of the radiation corresponding to the transition between the levels 2p10 and 5d5 of the krypton 86 atom." It was discovered in the 1970s that this spectral line was not symmetric, which put a limit on the precision with which the definition could be realized in interferometry experiments. ^ Larson, Ron; Hostetler, Robert P. (2007). Elementary and Intermediate Algebra: A Combined Course, Student Support Edition (4th illudtrated ed.). Cengage Learning. p. 197. ISBN 978-0-618-75354-3. ^ "Base unit definitions: Second". physics.nist.gov. Retrieved April 7, 2018. ^ Penrose, R (2004). The Road to Reality: A Complete Guide to the Laws of the Universe. Vintage Books. pp. 410–11. ISBN 978-0-679-77631-4. ... the most accurate standard for the metre is conveniently defined so that there are exactly 299,792,458 of them to the distance travelled by light in a standard second, giving a value for the metre that very accurately matches the now inadequately precise standard metre rule in Paris. ^ Uzan, J-P; Leclercq, B (2008). The Natural Laws of the Universe: Understanding Fundamental Constants. Springer. pp. 43–44. ISBN 978-0-387-73454-5. ^ Gibbs, Philip (1997). "How is the speed of light measured?". The Physics and Relativity FAQ. Archived from the original on 2015-08-21. ^ a b Stachel, JJ (2002). Einstein from "B" to "Z" – Volume 9 of Einstein studies. Springer. p. 226. ISBN 978-0-8176-4143-6. ^ Gibbs, P (2004) . "Why is c the symbol for the speed of light?". Usenet Physics FAQ. University of California, Riverside. Archived from the original on 2009-11-17. Retrieved 2009-11-16. "The origins of the letter c being used for the speed of light can be traced back to a paper of 1856 by Weber and Kohlrausch [...] Weber apparently meant c to stand for 'constant' in his force law, but there is evidence that physicists such as Lorentz and Einstein were accustomed to a common convention that c could be used as a variable for velocity. This usage can be traced back to the classic Latin texts in which c stood for 'celeritas' meaning 'speed'." ^ Mendelson, KS (2006). "The story of c". American Journal of Physics. 74 (11): 995–97. Bibcode:2006AmJPh..74..995M. doi:10.1119/1.2238887. Lide, DR (2004). CRC Handbook of Chemistry and Physics. CRC Press. pp. 2–9. ISBN 978-0-8493-0485-9. Harris, JW; et al. (2002). Handbook of Physics. Springer. p. 499. ISBN 978-0-387-95269-7. Whitaker, JC (2005). The Electronics Handbook. CRC Press. p. 235. ISBN 978-0-8493-1889-4. Cohen, ER; et al. (2007). Quantities, Units and Symbols in Physical Chemistry (3rd ed.). Royal Society of Chemistry. p. 184. ISBN 978-0-85404-433-7. ^ "CODATA value: Speed of Light in Vacuum". The NIST reference on Constants, Units, and Uncertainty. NIST. Retrieved 2009-08-21. ^ a b Jespersen, J; Fitz-Randolph, J; Robb, J (1999). From Sundials to Atomic Clocks: Understanding Time and Frequency (Reprint of National Bureau of Standards 1977, 2nd ed.). Courier Dover. p. 280. ISBN 978-0-486-40913-9. ^ Savard, J. "From Gold Coins to Cadmium Light". John Savard. Archived from the original on 2009-11-14. Retrieved 2009-11-14. ^ Lawrie, ID (2002). "Appendix C: Natural units". A Unified Grand Tour of Theoretical Physics (2nd ed.). CRC Press. p. 540. ISBN 978-0-7503-0604-1. ^ Hsu, L (2006). "Appendix A: Systems of units and the development of relativity theories". A Broader View of Relativity: General Implications of Lorentz and Poincaré Invariance (2nd ed.). World Scientific. pp. 427–28. ISBN 978-981-256-651-5. ^ Einstein, A (1905). "Zur Elektrodynamik bewegter Körper". Annalen der Physik (Submitted manuscript) (in German). 17 (10): 890–921. Bibcode:1905AnP...322..891E. doi:10.1002/andp.19053221004. English translation: Perrett, W. Walker, J (ed.). "On the Electrodynamics of Moving Bodies". Fourmilab. Translated by Jeffery, GB. Retrieved 2009-11-27. ^ Hsu, J-P; Zhang, YZ (2001). Lorentz and Poincaré Invariance. Advanced Series on Theoretical Physical Science. 8. World Scientific. pp. 543ff. ISBN 978-981-02-4721-8. ^ a b Zhang, YZ (1997). Special Relativity and Its Experimental Foundations. Advanced Series on Theoretical Physical Science. 4. World Scientific. pp. 172–73. ISBN 978-981-02-2749-4. Archived from the original on 2012-05-19. Retrieved 2009-07-23. ^ d'Inverno, R (1992). Introducing Einstein's Relativity. Oxford University Press. pp. 19–20. ISBN 978-0-19-859686-8. ^ Sriranjan, B (2004). "Postulates of the special theory of relativity and their consequences". The Special Theory to Relativity. PHI Learning Pvt. Ltd. pp. 20ff. ISBN 978-81-203-1963-9. ^ Roberts, T; Schleif, S (2007). Dlugosz, JM (ed.). "What is the experimental basis of Special Relativity?". Usenet Physics FAQ. University of California, Riverside. Archived from the original on 2009-10-15. Retrieved 2009-11-27. ^ Terrell, J (1959). "Invisibility of the Lorentz Contraction". Physical Review. 116 (4): 1041–5. Bibcode:1959PhRv..116.1041T. doi:10.1103/PhysRev.116.1041. ^ Penrose, R (1959). "The Apparent Shape of a Relativistically Moving Sphere". Proceedings of the Cambridge Philosophical Society. 55 (1): 137–39. Bibcode:1959PCPS...55..137P. doi:10.1017/S0305004100033776. ^ Hartle, JB (2003). Gravity: An Introduction to Einstein's General Relativity. Addison-Wesley. pp. 52–59. ISBN 978-981-02-2749-4. ^ Hartle, JB (2003). Gravity: An Introduction to Einstein's General Relativity. Addison-Wesley. p. 332. ISBN 978-981-02-2749-4. ^ Schäfer, G; Brügmann, MH (2008). "Propagation of light in the gravitational field of binary systems to quadratic order in Newton's gravitational constant: Part 3: 'On the speed-of-gravity controversy'". In Dittus, H; Lämmerzahl, C; Turyshev, SG (eds.). Lasers, clocks and drag-free control: Exploration of relativistic gravity in space. Springer. ISBN 978-3-540-34376-9. ^ a b Gibbs, P (1997) . Carlip, S (ed.). "Is The Speed of Light Constant?". Usenet Physics FAQ. University of California, Riverside. Archived from the original on 2009-11-17. Retrieved 2009-11-26. ^ Ellis, GFR; Uzan, J-P (2005). "'c' is the speed of light, isn't it?". American Journal of Physics. 73 (3): 240–27. arXiv:gr-qc/0305099. Bibcode:2005AmJPh..73..240E. doi:10.1119/1.1819929. The possibility that the fundamental constants may vary during the evolution of the universe offers an exceptional window onto higher dimensional theories and is probably linked with the nature of the dark energy that makes the universe accelerate today. ^ Mota, DF (2006). Variations of the Fine Structure Constant in Space and Time (PDF) (PhD). arXiv:astro-ph/0401631. Bibcode:2004astro.ph..1631M. ^ Uzan, J-P (2003). "The fundamental constants and their variation: observational status and theoretical motivations". Reviews of Modern Physics. 75 (2): 403. arXiv:hep-ph/0205340. Bibcode:2003RvMP...75..403U. doi:10.1103/RevModPhys.75.403. ^ Amelino-Camelia, G (2013). "Quantum Gravity Phenomenology". Living Reviews in Relativity. 16 (1): 5. arXiv:0806.0339. Bibcode:2013LRR....16....5A. doi:10.12942/lrr-2013-5. PMC 5255913. PMID 28179844. ^ Herrmann, S; et al. (2009). "Rotating optical cavity experiment testing Lorentz invariance at the 10−17 level". Physical Review D. 80 (100): 105011. arXiv:1002.1284. Bibcode:2009PhRvD..80j5011H. doi:10.1103/PhysRevD.80.105011. ^ Lang, KR (1999). Astrophysical formulae (3rd ed.). Birkhäuser. p. 152. ISBN 978-3-540-29692-8. ^ "It's official: Time machines won't work". Los Angeles Times. 25 July 2011. ^ "HKUST Professors Prove Single Photons Do Not Exceed the Speed of Light". The Hong Kong University of Science and Technology. 2011-07-19. ^ Shanchao Zhang; J.F. Chen; Chang Liu; M.M.T. Loy; G.K.L. Wong; Shengwang Du (16 June 2011). "Optical Precursor of a Single Photon". Phys. Rev. Lett. 106 (243602): 243602. Bibcode:2011PhRvL.106x3602Z. doi:10.1103/physrevlett.106.243602. PMID 21770570. ^ Fowler, M (March 2008). "Notes on Special Relativity" (PDF). University of Virginia. p. 56. Retrieved 2010-05-07. ^ Liberati, S; Sonego, S; Visser, M (2002). "Faster-than-c signals, special relativity, and causality". Annals of Physics. 298 (1): 167–85. arXiv:gr-qc/0107091. Bibcode:2002AnPhy.298..167L. doi:10.1006/aphy.2002.6233. ^ Taylor, EF; Wheeler, JA (1992). Spacetime Physics. W.H. Freeman. pp. 74–75. ISBN 978-0-7167-2327-1. ^ Tolman, RC (2009) . "Velocities greater than that of light". The Theory of the Relativity of Motion (Reprint ed.). BiblioLife. p. 54. ISBN 978-1-103-17233-7. ^ Hecht, E (1987). Optics (2nd ed.). Addison-Wesley. p. 62. ISBN 978-0-201-11609-0. ^ Quimby, RS (2006). Photonics and lasers: an introduction. John Wiley and Sons. p. 9. ISBN 978-0-471-71974-8. ^ Wertheim, M (2007-06-20). "The Shadow Goes". The New York Times. Retrieved 2009-08-21. ^ a b c d Gibbs, P (1997). "Is Faster-Than-Light Travel or Communication Possible?". Usenet Physics FAQ. University of California, Riverside. Archived from the original on 2009-11-17. Retrieved 2008-08-20. ^ Sakurai, JJ (1994). Tuan, SF (ed.). Modern Quantum Mechanics (Revised ed.). Addison-Wesley. pp. 231–32. ISBN 978-0-201-53929-5. ^ Muga, JG; Mayato, RS; Egusquiza, IL, eds. (2007). Time in Quantum Mechanics. Springer. p. 48. ISBN 978-3-540-73472-7. ^ Hernández-Figueroa, HE; Zamboni-Rached, M; Recami, E (2007). Localized Waves. Wiley Interscience. p. 26. ISBN 978-0-470-10885-7. ^ Rees, M (1966). "The Appearance of Relativistically Expanding Radio Sources". Nature. 211 (5048): 468. Bibcode:1966Natur.211..468R. doi:10.1038/211468a0. ^ Chase, IP. "Apparent Superluminal Velocity of Galaxies". Usenet Physics FAQ. University of California, Riverside. Retrieved 2009-11-26. ^ Harrison, ER (2003). Masks of the Universe. Cambridge University Press. p. 206. ISBN 978-0-521-77351-5. ^ Panofsky, WKH; Phillips, M (1962). Classical Electricity and Magnetism. Addison-Wesley. p. 182. ISBN 978-0-201-05702-7. ^ Schaefer, BE (1999). "Severe limits on variations of the speed of light with frequency". Physical Review Letters. 82 (25): 4964–66. arXiv:astro-ph/9810479. Bibcode:1999PhRvL..82.4964S. doi:10.1103/PhysRevLett.82.4964. ^ Ellis, J; Mavromatos, NE; Nanopoulos, DV; Sakharov, AS (2003). "Quantum-Gravity Analysis of Gamma-Ray Bursts using Wavelets". Astronomy & Astrophysics. 402 (2): 409–24. arXiv:astro-ph/0210124. Bibcode:2003A&A...402..409E. doi:10.1051/0004-6361:20030263. ^ Füllekrug, M (2004). "Probing the Speed of Light with Radio Waves at Extremely Low Frequencies". Physical Review Letters. 93 (4): 043901. Bibcode:2004PhRvL..93d3901F. doi:10.1103/PhysRevLett.93.043901. PMID 15323762. ^ a b Adelberger, E; Dvali, G; Gruzinov, A (2007). "Photon Mass Bound Destroyed by Vortices". Physical Review Letters. 98 (1): 010402. arXiv:hep-ph/0306245. Bibcode:2007PhRvL..98a0402A. doi:10.1103/PhysRevLett.98.010402. PMID 17358459. ^ Sidharth, BG (2008). The Thermodynamic Universe. World Scientific. p. 134. ISBN 978-981-281-234-6. ^ Amelino-Camelia, G (2009). "Astrophysics: Burst of support for relativity". Nature. 462 (7271): 291–92. Bibcode:2009Natur.462..291A. doi:10.1038/462291a. PMID 19924200. Lay summary – Nature (19 November 2009). ^ de Podesta, M (2002). Understanding the Properties of Matter. CRC Press. p. 131. ISBN 978-0-415-25788-6. ^ "Optical constants of H2O, D2O (Water, heavy water, ice)". refractiveindex.info. Mikhail Polyanskiy. Retrieved 2017-11-07. ^ "Optical constants of Soda lime glass". refractiveindex.info. Mikhail Polyanskiy. Retrieved 2017-11-07. ^ "Optical constants of C (Carbon, diamond, graphite)". refractiveindex.info. Mikhail Polyanskiy. Retrieved 2017-11-07. ^ Cromie, William J. (2001-01-24). "Researchers now able to stop, restart light". Harvard University Gazette. Archived from the original on 2011-10-28. Retrieved 2011-11-08. ^ Milonni, PW (2004). Fast light, slow light and left-handed light. CRC Press. p. 25. ISBN 978-0-7503-0926-4. ^ Toll, JS (1956). "Causality and the Dispersion Relation: Logical Foundations". Physical Review. 104 (6): 1760–70. Bibcode:1956PhRv..104.1760T. doi:10.1103/PhysRev.104.1760. ^ Hau, LV; Harris, SE; Dutton, Z; Behroozi, CH (1999). "Light speed reduction to 17 metres per second in an ultracold atomic gas". Nature. 397 (6720): 594–98. Bibcode:1999Natur.397..594V. doi:10.1038/17561. ^ Liu, C; Dutton, Z; Behroozi, CH; Hau, LV (2001). "Observation of coherent optical information storage in an atomic medium using halted light pulses". Nature. 409 (6819): 490–93. Bibcode:2001Natur.409..490L. doi:10.1038/35054017. PMID 11206540. ^ Bajcsy, M; Zibrov, AS; Lukin, MD (2003). "Stationary pulses of light in an atomic medium". Nature. 426 (6967): 638–41. arXiv:quant-ph/0311092. Bibcode:2003Natur.426..638B. doi:10.1038/nature02176. PMID 14668857. ^ Dumé, B (2003). "Switching light on and off". Physics World. Institute of Physics. Retrieved 2008-12-08. ^ Whitehouse, D (19 July 2000). "Beam Smashes Light Barrier". BBC News. Retrieved 2008-12-08. ^ a b Milonni, PW (2004). "2". Fast light, slow light and left-handed light. CRC Press. ISBN 978-0-7503-0926-4. ^ Cherenkov, Pavel A. (1934). "Видимое свечение чистых жидкостей под действием γ-радиации" [Visible emission of pure liquids by action of γ radiation]. Doklady Akademii Nauk SSSR. 2: 451. Reprinted: Cherenkov, P.A. (1967). "Видимое свечение чистых жидкостей под действием γ-радиации" [Visible emission of pure liquids by action of γ radiation]. Usp. Fiz. Nauk. 93 (10): 385. doi:10.3367/ufnr.0093.196710n.0385. , and in A.N. Gorbunov; E.P. Čerenkova, eds. (1999). Pavel Alekseyevich Čerenkov: Chelovek i Otkrytie [Pavel Alekseyevich Čerenkov: Man and Discovery]. Moscow: Nauka. pp. 149–53. ^ Parhami, B (1999). Introduction to parallel processing: algorithms and architectures. Plenum Press. p. 5. ISBN 978-0-306-45970-2. ^ Imbs, D; Raynal, Michel (2009). Malyshkin, V (ed.). Software Transactional Memories: An Approach for Multicore Programming. 10th International Conference, PaCT 2009, Novosibirsk, Russia, August 31 – September 4, 2009. Springer. p. 26. ISBN 978-3-642-03274-5. ^ Midwinter, JE (1991). Optical Fibers for Transmission (2nd ed.). Krieger Publishing Company. ISBN 978-0-89464-595-2. ^ "Theoretical vs real-world speed limit of Ping". Pingdom. June 2007. Retrieved 2010-05-05. ^ "Day 4: Lunar Orbits 7, 8 and 9". The Apollo 8 Flight Journal. NASA. Archived from the original on 2011-01-04. Retrieved 2010-12-16. ^ a b "Hubble Reaches the "Undiscovered Country" of Primeval Galaxies" (Press release). Space Telescope Science Institute. 5 January 2010. ^ "The Hubble Ultra Deep Field Lithograph" (PDF). NASA. Retrieved 2010-02-04. ^ "The IAU and astronomical units". International Astronomical Union. Retrieved 2010-10-11. ^ Further discussion can be found at "StarChild Question of the Month for March 2000". StarChild. NASA. 2000. Retrieved 2009-08-22. ^ Dickey, JO; et al. (July 1994). "Lunar Laser Ranging: A Continuing Legacy of the Apollo Program" (PDF). Science. 265 (5171): 482–90. Bibcode:1994Sci...265..482D. doi:10.1126/science.265.5171.482. PMID 17781305. ^ Standish, EM (February 1982). "The JPL planetary ephemerides". Celestial Mechanics. 26 (2): 181–86. Bibcode:1982CeMec..26..181S. doi:10.1007/BF01230883. ^ Berner, JB; Bryant, SH; Kinman, PW (November 2007). "Range Measurement as Practiced in the Deep Space Network" (PDF). Proceedings of the IEEE. 95 (11): 2202–2214. doi:10.1109/JPROC.2007.905128. ^ "Time is money when it comes to microwaves". Financial Times. 10 May 2013. Retrieved 25 April 2014. ^ Buchanan, Mark (11 February 2015). "Physics in finance: Trading at the speed of light". Nature. 518 (7538): 161–163. doi:10.1038/518161a. PMID 25673397. ^ a b c "Resolution 1 of the 17th CGPM". BIPM. 1983. Retrieved 2009-08-23. ^ a b Cohen, IB (1940). "Roemer and the first determination of the velocity of light (1676)". Isis. 31 (2): 327–79. doi:10.1086/347594. ^ a b c "Demonstration tovchant le mouvement de la lumiere trouvé par M. Rŏmer de l'Académie Royale des Sciences" [Demonstration to the movement of light found by Mr. Römer of the Royal Academy of Sciences] (PDF). Journal des sçavans (in French): 233–36. 1676. Translated in "A demonstration concerning the motion of light, communicated from Paris, in the Journal des Sçavans, and here made English". Philosophical Transactions of the Royal Society. 12 (136): 893–95. 1677. Bibcode:1677RSPT...12..893.. doi:10.1098/rstl.1677.0024. Reproduced in Hutton, C; Shaw, G; Pearson, R, eds. (1809). "On the Motion of Light by M. Romer". The Philosophical Transactions of the Royal Society of London, from Their Commencement in 1665, in the Year 1800: Abridged. Vol. II. From 1673 to 1682. London: C. & R. Baldwin. pp. 397–98. The account published in Journal des sçavans was based on a report that Rømer read to the French Academy of Sciences in November 1676 (Cohen, 1940, p. 346). ^ a b c d Bradley, J (1729). "Account of a new discoved Motion of the Fix'd Stars". Philosophical Transactions. 35: 637–60. ^ a b "Resolution B2 on the re-definition of the astronomical unit of length" (PDF). International Astronomical Union. 2012. ^ "The International System of Units, Supplement 2014: Updates to the 8th edition (2006) of the SI Brochure" (PDF). International Bureau of Weights and Measures. 2014: 14. ^ Pitjeva, EV; Standish, EM (2009). "Proposals for the masses of the three largest asteroids, the Moon–Earth mass ratio and the Astronomical Unit". Celestial Mechanics and Dynamical Astronomy. 103 (4): 365–72. Bibcode:2009CeMDA.103..365P. doi:10.1007/s10569-009-9203-8. ^ a b IAU Working Group on Numerical Standards for Fundamental Astronomy. "IAU WG on NSFA Current Best Estimates". US Naval Observatory. Archived from the original on 2009-12-08. Retrieved 2009-09-25. ^ "Astrodynamic Constants". Solar System Dynamics. Jet Propulsion Laboratory. Retrieved 2017-11-08. ^ "NPL's Beginner's Guide to Length". UK National Physical Laboratory. Archived from the original on 2010-08-31. Retrieved 2009-10-28. ^ a b c d e Gibbs, P (1997). "How is the speed of light measured?". Usenet Physics FAQ. University of California, Riverside. Archived from the original on 2015-08-21. Retrieved 2010-01-13. ^ Fowler, M. "The Speed of Light". University of Virginia. Retrieved 2010-04-21. ^ Cooke, J; Martin, M; McCartney, H; Wilf, B (1968). "Direct determination of the speed of light as a general physics laboratory experiment". American Journal of Physics. 36 (9): 847. Bibcode:1968AmJPh..36..847C. doi:10.1119/1.1975166. ^ Aoki, K; Mitsui, T (2008). "A small tabletop experiment for a direct measurement of the speed of light". American Journal of Physics. 76 (9): 812–15. arXiv:0705.3996. Bibcode:2008AmJPh..76..812A. doi:10.1119/1.2919743. ^ James, MB; Ormond, RB; Stasch, AJ (1999). "Speed of light measurement for the myriad". American Journal of Physics. 67 (8): 681–714. Bibcode:1999AmJPh..67..681J. doi:10.1119/1.19352. ^ a b c d e Essen, L; Gordon-Smith, AC (1948). "The Velocity of Propagation of Electromagnetic Waves Derived from the Resonant Frequencies of a Cylindrical Cavity Resonator". Proceedings of the Royal Society of London A. 194 (1038): 348–61. Bibcode:1948RSPSA.194..348E. doi:10.1098/rspa.1948.0085. JSTOR 98293. ^ a b Rosa, EB; Dorsey, NE (1907). "The Ratio of the Electromagnetic and Electrostatic Units". Bulletin of the Bureau of Standards. 3 (6): 433. Bibcode:1906PhRvI..22..367R. doi:10.1103/PhysRevSeriesI.22.367. ^ Essen, L (1947). "Velocity of Electromagnetic Waves". Nature. 159 (4044): 611–12. Bibcode:1947Natur.159..611E. doi:10.1038/159611a0. ^ a b Essen, L (1950). "The Velocity of Propagation of Electromagnetic Waves Derived from the Resonant Frequencies of a Cylindrical Cavity Resonator". Proceedings of the Royal Society of London A. 204 (1077): 260–77. Bibcode:1950RSPSA.204..260E. doi:10.1098/rspa.1950.0172. JSTOR 98433. ^ Stauffer, RH (April 1997). "Finding the Speed of Light with Marshmallows". The Physics Teacher. 35 (4): 231. Bibcode:1997PhTea..35..231S. doi:10.1119/1.2344657. Retrieved 2010-02-15. ^ "BBC Look East at the speed of light". BBC Norfolk website. Retrieved 2010-02-15. ^ Vaughan, JM (1989). The Fabry-Perot interferometer. CRC Press. pp. 47, 384–91. ISBN 978-0-85274-138-2. ^ a b Froome, KD (1958). "A New Determination of the Free-Space Velocity of Electromagnetic Waves". Proceedings of the Royal Society of London. Series A, Mathematical and Physical Sciences. 247 (1248): 109–22. Bibcode:1958RSPSA.247..109F. doi:10.1098/rspa.1958.0172. JSTOR 100591. ^ a b Sullivan, DB (2001). "Speed of Light from Direct Frequency and Wavelength Measurements". In Lide, DR (ed.). A Century of Excellence in Measurements, Standards, and Technology (PDF). CRC Press. pp. 191–93. ISBN 978-0-8493-1247-2. Archived from the original (PDF) on 2009-08-13. ^ a b c Evenson, KM; et al. (1972). "Speed of Light from Direct Frequency and Wavelength Measurements of the Methane-Stabilized Laser". Physical Review Letters. 29 (19): 1346–49. Bibcode:1972PhRvL..29.1346E. doi:10.1103/PhysRevLett.29.1346. ^ a b Galilei, G (1954) . Dialogues Concerning Two New Sciences. Crew, H; de Salvio A (trans.). Dover Publications. p. 43. ISBN 978-0-486-60099-4. ^ a b Boyer, CB (1941). "Early Estimates of the Velocity of Light". Isis. 33 (1): 24. doi:10.1086/358523. ^ a b Huygens, C (1690). Traitée de la Lumière (in French). Pierre van der Aa. pp. 8–9. ^ Michelson, A. A. (1927). "Measurement of the Velocity of Light Between Mount Wilson and Mount San Antonio". The Astrophysical Journal. 65: 1. Bibcode:1927ApJ....65....1M. doi:10.1086/143021. ^ Sarton, G (1993). Ancient science through the golden age of Greece. Courier Dover. p. 248. ISBN 978-0-486-27495-9. ^ Gross, CG (1999). "The Fire That Comes from the Eye". Neuroscientist. 5: 58–64. doi:10.1177/107385849900500108. ^ Hamarneh, S (1972). "Review: Hakim Mohammed Said, Ibn al-Haitham". Isis. 63 (1): 119. doi:10.1086/350861. ^ a b Lester, PM (2005). Visual Communication: Images With Messages. Thomson Wadsworth. pp. 10–11. ISBN 978-0-534-63720-0. ^ O'Connor, JJ; Robertson, EF. "Abu Ali al-Hasan ibn al-Haytham". MacTutor History of Mathematics archive. University of St Andrews. Retrieved 2010-01-12. ^ Lauginie, P (2004). Measuring Speed of Light: Why? Speed of what? (PDF). Fifth International Conference for History of Science in Science Education. Keszthely, Hungary. pp. 75–84. Archived from the original (PDF) on 2015-07-04. Retrieved 2017-08-12. ^ O'Connor, JJ; Robertson, EF. "Abu han Muhammad ibn Ahmad al-Biruni". MacTutor History of Mathematics archive. University of St Andrews. Retrieved 2010-01-12. ^ Lindberg, DC (1996). Roger Bacon and the origins of Perspectiva in the Middle Ages: a critical edition and English translation of Bacon's Perspectiva, with introduction and notes. Oxford University Press. p. 143. ISBN 978-0-19-823992-5. ^ Lindberg, DC (1974). "Late Thirteenth-Century Synthesis in Optics". In Edward Grant (ed.). A source book in medieval science. Harvard University Press. p. 396. ISBN 978-0-674-82360-0. ^ Marshall, P (1981). "Nicole Oresme on the Nature, Reflection, and Speed of Light". Isis. 72 (3): 357–74 [367–74]. doi:10.1086/352787. ^ Newton, I (1704). "Prop. XI". Optiks. The text of Prop. XI is identical between the first (1704) and second (1719) editions. ^ Guarnieri, M. (2015). "Two Millennia of Light: The Long Path to Maxwell's Waves". IEEE Industrial Electronics Magazine. 9 (2): 54–56, 60. doi:10.1109/MIE.2015.2421754. ^ Kirchhoff, G (1857). "Über die Bewegung der Elektricität". Ann. Phys. 178 (12): 529–44. Bibcode:1857AnP...178..529K. doi:10.1002/andp.18571781203. ^ O'Connor, JJ; Robertson, EF (November 1997). "James Clerk Maxwell". School of Mathematics and Statistics, University of St Andrews. Archived from the original on 2011-01-28. Retrieved 2010-10-13. ^ Michelson, AA; Morley, EW (1887). "On the Relative Motion of the Earth and the Luminiferous Ether" . American Journal of Science. 34 (203): 333–45. doi:10.2475/ajs.s3-34.203.333. ^ French, AP (1983). Special relativity. Van Nostrand Reinhold. pp. 51–57. ISBN 978-0-442-30782-0. ^ Darrigol, O (2000). Electrodynamics from Ampére to Einstein. Clarendon Press. ISBN 978-0-19-850594-5. ^ Galison, P (2003). Einstein's Clocks, Poincaré's Maps: Empires of Time. W.W. Norton. ISBN 978-0-393-32604-8. ^ Miller, AI (1981). Albert Einstein's special theory of relativity. Emergence (1905) and early interpretation (1905–1911). Addison–Wesley. ISBN 978-0-201-04679-3. ^ Pais, A (1982). Subtle is the Lord: The Science and the Life of Albert Einstein. Oxford University Press. ISBN 978-0-19-520438-4. ^ "Resolution 6 of the 15th CGPM". BIPM. 1967. Retrieved 2010-10-13. ^ Barger, R.; Hall, J. (1973). "Wavelength of the 3.39-μm laser-saturated absorption line of methane". Applied Physics Letters. 22 (4): 196. Bibcode:1973ApPhL..22..196B. doi:10.1063/1.1654608. ^ "Resolution 2 of the 15th CGPM". BIPM. 1975. Retrieved 2009-09-09. ^ Taylor, EF; Wheeler, JA (1992). Spacetime Physics: Introduction to Special Relativity (2nd ed.). Macmillan. ISBN 978-0-7167-2327-1. ^ Penzes, WB (2009). "Time Line for the Definition of the Meter" (PDF). NIST. Retrieved 2010-01-11. ^ Adams, S (1997). Relativity: An Introduction to Space–Time Physics. CRC Press. p. 140. ISBN 978-0-7484-0621-0. One peculiar consequence of this system of definitions is that any future refinement in our ability to measure c will not change the speed of light (which is a defined number), but will change the length of the meter! ^ Rindler, W (2006). Relativity: Special, General, and Cosmological (2nd ed.). Oxford University Press. p. 41. ISBN 978-0-19-856731-8. Note that [...] improvements in experimental accuracy will modify the meter relative to atomic wavelengths, but not the value of the speed of light! ^ "The "explicit-constant" formulation". BIPM. 2011. Archived from the original on 2014-08-11. Rømer, O (1676). "Démonstration touchant le mouvement de la lumière trouvé par M. Römer de l'Academie Royale des Sciences". Journal des sçavans (in French): 223–36. Archived from the original on 2007-07-29. Translated as "A Demonstration concerning the Motion of Light". Philosophical Transactions of the Royal Society. 12 (136): 893–94. 1677. Bibcode:1677RSPT...12..893.. doi:10.1098/rstl.1677.0024. Archived from the original on 2007-07-29. Halley, E (1694). "Monsieur Cassini, his New and Exact Tables for the Eclipses of the First Satellite of Jupiter, reduced to the Julian Stile and Meridian of London". Philosophical Transactions of the Royal Society. 18 (214): 237–56. doi:10.1098/rstl.1694.0048. Foucault, JL (1862). "Détermination expérimentale de la vitesse de la lumière: parallaxe du Soleil". Comptes rendus de l'Académie des sciences (in French). 55: 501–03, 792–96. Michelson, AA (1878). "Experimental Determination of the Velocity of Light". Proceedings of the American Association of Advanced Science. 27: 71–77. Michelson, AA; Pease, FG; Pearson, F (1935). "Measurement of the Velocity of Light in a Partial Vacuum". Astrophysical Journal. 82: 26–61. Bibcode:1935ApJ....82...26M. doi:10.1086/143655. Newcomb, S (1886). "The Velocity of Light". Nature. 34 (863): 29–32. Bibcode:1886Natur..34...29.. doi:10.1038/034029c0. Perrotin, J (1900). "Sur la vitesse de la lumière". Comptes rendus de l'Académie des sciences (in French). 131: 731–34. Brillouin, L (1960). Wave propagation and group velocity. Academic Press. Jackson, JD (1975). Classical Electrodynamics (2nd ed.). John Wiley & Sons. ISBN 978-0-471-30932-1. Keiser, G (2000). Optical Fiber Communications (3rd ed.). McGraw-Hill. p. 32. ISBN 978-0-07-232101-2. Ng, YJ (2004). "Quantum Foam and Quantum Gravity Phenomenology". In Amelino-Camelia, G; Kowalski-Glikman, J (eds.). Planck Scale Effects in Astrophysics and Cosmology. Springer. pp. 321ff. ISBN 978-3-540-25263-4. Helmcke, J; Riehle, F (2001). "Physics behind the definition of the meter". In Quinn, TJ; Leschiutta, S; Tavella, P (eds.). Recent advances in metrology and fundamental constants. IOS Press. p. 453. ISBN 978-1-58603-167-1. Duff, MJ (2004). "Comment on time-variation of fundamental constants". arXiv:hep-th/0208093. "Test Light Speed in Mile Long Vacuum Tube." Popular Science Monthly, September 1930, pp. 17–18. This page was last edited on 12 April 2019, at 09:01 (UTC).